The Essence of Home: It's a Good Thing! Do you remember watching the Martha Stewart Show and she would always have a "good thing" segment? I always liked those and hearing her say, "It's a good thing". Well I thought I would share some of my "good things" in my yard. The thing that makes me the happiest right now is our humble little garden. 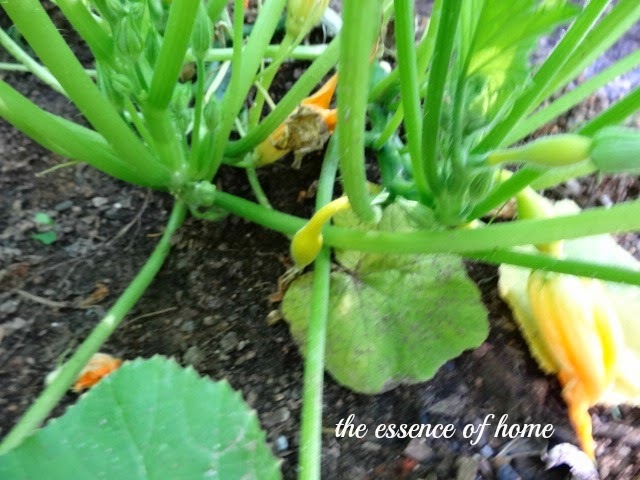 Eating home grown vegetables from your garden, is a good thing! Another "good thing" in my yard are these fragrant gardenias. These bushes are right outside our garage next to the driveway and smell wonderful every time I go out there. 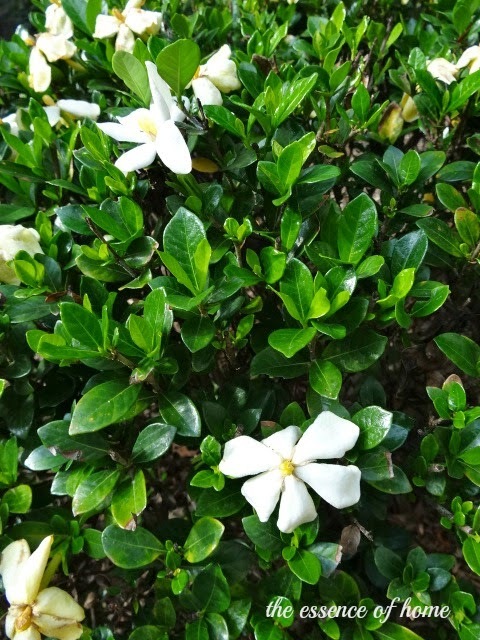 Smelling gardenias on your way to loading the trashcan in the driveway, is a good thing! Next to the gardenia's are these lillies. They are just starting to bloom also. Adding a little color next to the driveway, is a good thing! 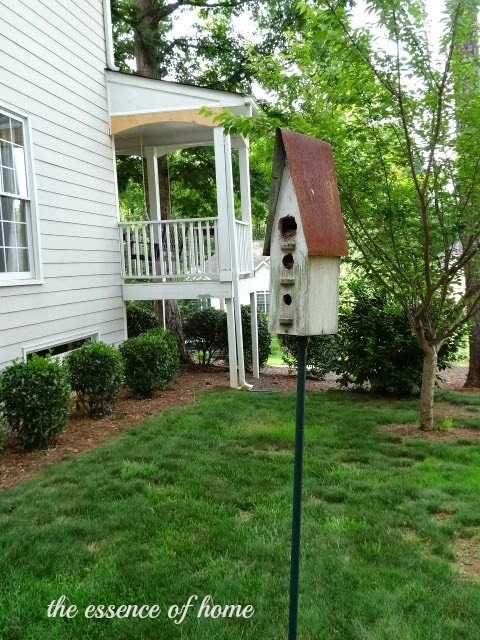 On the other side of the house, this birdhouse is now home to a family of blue birds. Watching blue birds fly in and out of their house while you eat breakfast in your kitchen, is a good thing! Do you remember me telling you that our arbor fell over and broke during the snow storm last winter? Well, I thought my jasmine vine, that grew over the arbor, was dead. We hauled off the arbor and the remains of the vine. But look what appeared this Spring? It's growing again and needs another arbor to grow up on. That's a hearty vine! Guess I'll need to get my husband to build one or find another metal one like I had before. Having a vine grow over an arbor that makes a charming entrance to a back yard, is a good thing! 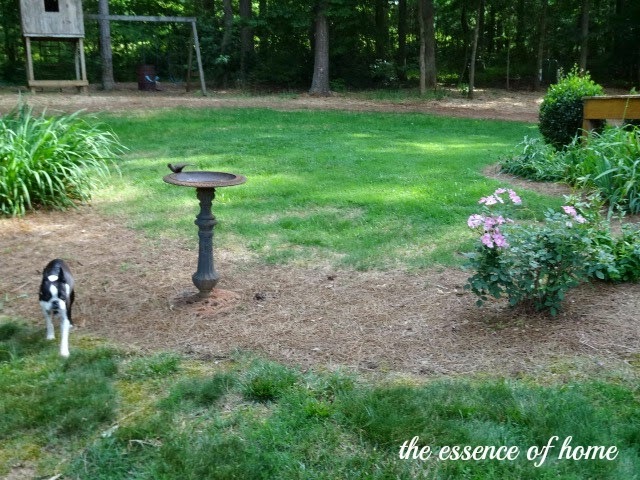 Also, I moved the bird bath over to the pinestraw area. I love it there. Still need to plant more flowering bushes in that area though. A place for flowers and a birdbath, is a good thing! And lastly, this is a VERY special hydrangea bush. I know it doesn't look like much, but it was beautiful when I first received it. It was given to me by the photographers that came out last February to shoot my house for a magazine. It had blue blooms on it then. I made sure to plant it in the yard this Spring in hopes of keeping it alive. Time will tell. I'm babying it for sure! 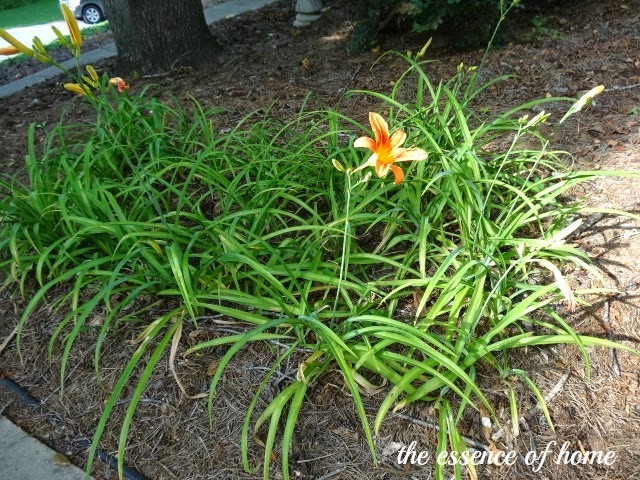 Having a sentimental plant in the garden, is a good thing! Well that's a brief tour of some of my "good things" around the yard. I'm hoping to get our front porch bleached and cleaned up on Monday so I can share that with you too. We are late getting to it this year! Having a clean front porch to enjoy, will be a good thing! Your plants are all looking healthy. I've seen the pine needle straw/mulch, I love how it looks. Very nice! We have a wisteria vine that is full and lush but has never produced a flower. Even though when we bought it a few years back it had flowers on it. Not sure what's going on with that. Would love having something with a scent, I wonder if jasmine would work in my area. I'll have to check on that. Have a delightful day! Kelly, all your 'good things' are such 'good things'. I love 'good things' too, except for unpacking after vacation...not such a good thing! These are very good things, Kelly! 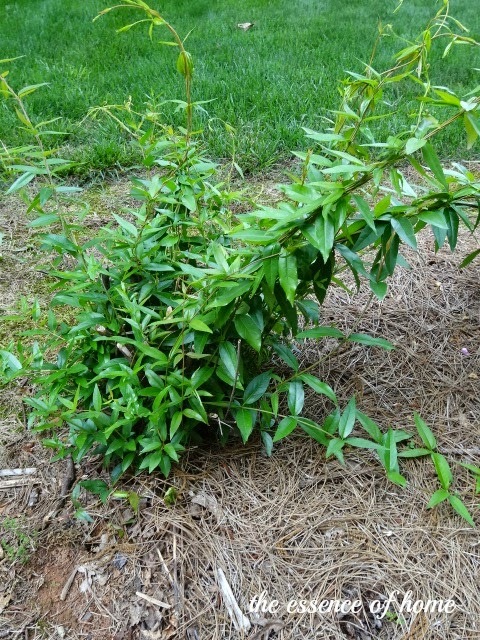 The ice storm killed my jasmine. We had a few new vines that popped up earlier this Spring; but, I just decided to relocate those. Your hydrangea is looking good, too! Your yard looks lovely with the pretty plantings, Kelly. I planted a birthday gifted bydrangea floral two years ago and after this winter was surprised to see that it not only survived but is doing well. Hoping yours continues to do well. Those are all very good things! Your veggies look amazing already. I'm not growing anything this year...I'll just have to depend on my mom to bring me fresh tomatoes from her garden. :) Love your gardenia too...I've never been able to grow them. Mine has one or two blooms each year and hasn't grown an inch since I planted it about 3 years ago. Lol! Many years ago seems like Martha came on at about 9 a.m. Saturday mornings. I could be wrong. She was soothing to listen to, and that my dear, is a good thing. Loving all your good things. 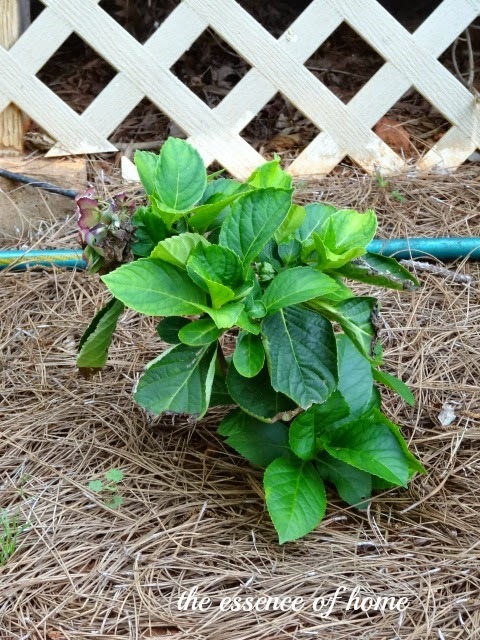 I also have a very special hydrangea bush that was giving to me when my granddaughter was born 14 years ago. I thought it had died over the harsh winter that we had, because it was not getting green this year. We cut down on the dead brown stuff and to my surprise it really took off and is growing. Now...I'm just waiting to see if it blooms. Good things for sure. I'm so jealous of your gardenias! They don't grow here and I think that's one of the best smells ever. I like that - "good things". Your garden is definitely a good thing. You've got lots of fresh veggies growing in your small garden, Kelly! 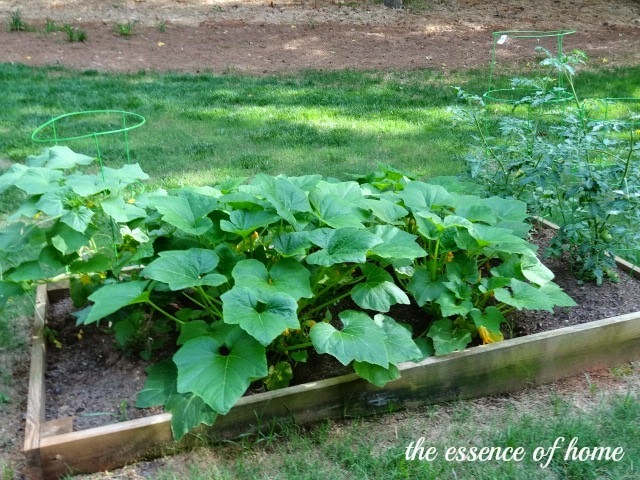 I've been wanting to start a vegetable garden and a small raised bed like yours looks like the way to go. I hope your hydrangea thrives outdoors! Just beautiful, your yard, your garden...my I'm ready for a big salad from your garden. Wow look at the size of those tomatoes already!! My plants are so tiny ..might see tomatoes by August. Love your wee tour of the gardens. They are all very good things. I hope your hydrangea blooms for you. I love your birdbath. It's so pretty. Finally, the blue birds in the morning would be amazing. I love blue birds. Have a great week. Definitely some 'good things'! I'm jealous of those tomatoes. We have tried and tried to grow tomatoes - walnut tree in the neighbors tree line needs to go! I love every single one of your 'good things!' I wish we could have a garden but we have tried and failed several times. One year Louis DEan planted onions in all my flower beds! They did very well but it looked strange to see them growing in unexpected places. 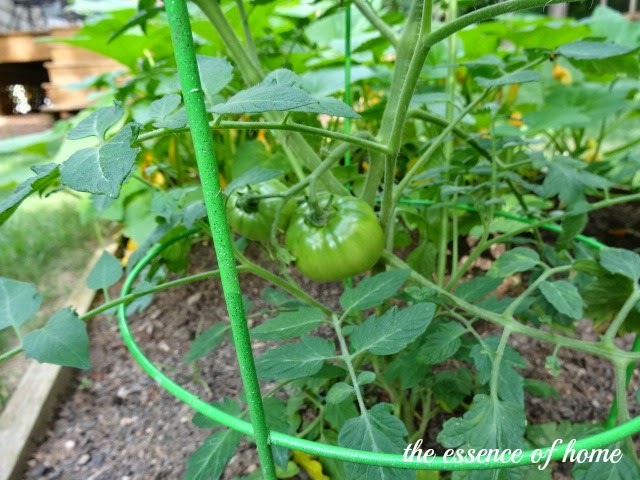 He also planted tomato vines along the driveway and they were so ugly and gangly and NO tomatoes! Well, we did get ONE tiny one! Gardenias is one of my all time favorites and I used to have a bush that did well. Now I can NOT get one to grow for me although I may just have to give it one last try after seeing yours!! Stopping by from Penny's and I very much enjoyed the "good things" tour of your yard. How great to have the jasmine pull through after all the trauma. All 'good things', indeed, Kelly! It really IS lovely to have a garden. These are very "Good Things", I loved those segments on Martha Stewart too. What a wonderful surprise with your Jasmine!! can't wait to see it over your new arbor. So many good things! Your veggie garden is a little ahead of mine. That jasmine is one tough plant! I have my post up with your link. Thanks for participating! Kelly your garden is looking so good. So happy your vine came back. Your birdbath is great too. It is "a good thing"! What a cute post Kelly! My Hydrangeas have finally started to bloom. LOVE them! Your garden is looking great and eating fresh veggies is "a good thing"
Love your flowers and your vegetable garden...and how nice it was that they gave you that hydrangea...you will have fond memories every time you clip those beautiful flowers!...It's a good thing!